Shipping charges to US addresses included in prices. Please call 207-926-4438 for international shipping quotes. Exchanges accepted up to 30 days from purchase. Returns accepted up to 30 days from purchase - store credit will be given. No cash refunds. Third-grade alpaca with recycled fabric. Care Instructions: Gentle wash with cold water-hang or lay flat to dry. Ideal to carry just about anything around. 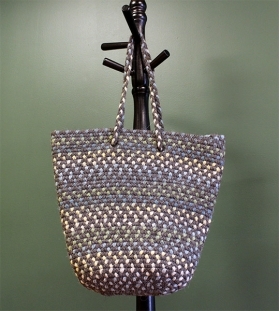 This beautiful tote is made from 2/3 alpaca yarn and 1/3 recycled fabric. Colors vary depending on the alpaca yarn and recycled fabric available. Approximately 16” wide by 16” tall, with plenty of room for fiber art supplies, or even groceries! Tote is made in the USA. Colors in photo are not necessarily colors available. Contact us for photos or description of totes on hand, or let us choose for you.